If you suspect that someone is intercepting your email or your Gmail account is hacked or your are victim of phishing then there is a good news for you. Now Google has added a new layer of information and control. With this new feature, you can track your recent sessions and you can also sign yourself out remotely. Using the above feature you can determine or verify if your mailbox was opened from another location. 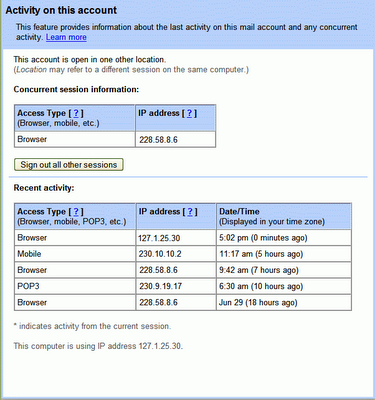 The top table, under "Concurrent session information," indicates all open sessions, along with IP address and "access type" -- which refers to how email was retrieved, for example, through iGoogle, POP3 or a mobile phone. The bottom table, under "Recent activity," contains my most recent history along with times of access. I can also view my current IP address at the very bottom of this window, where it says "This computer is using IP address..."
With this information, I can quickly verify that all the Gmail activity was indeed mine. I remember using Gmail at the times and locations listed. Being extra cautious, I can also click on the "Sign out all other sessions"